Firstly, thank you for this colour font - it works wonderfully in Firefox on Ubuntu. The only issue is that the text on tabs, in the URL bar, menus, etc now uses a Serif font which looks a bit ugly. Is there any way to keep the Emoji font, but have FF use a different fallback font for its application text? You're welcome! 😄 It's been a lot of work and I've learned a lot. I'm running MATE with a theme and it is using the correct font for the Firefox UI. That's my excuse for not noticing it! :) I just confirmed, it's fine in my Fedora VM also. I haven't tried it in the newest Ubuntu though. The fonts.conf in the readme adds Emoji One Color to the sans-serif, serif and monospace lists separately, which as I understand, shouldn't change the overall font used. The font contains no letter glyphs, so the next font in the list should be used. Can you give me the list of fallback fonts for sans-serif? EmojiOneColor-SVGinOT.ttf: "Emoji One Color" "SVGinOT"
DroidSansFallbackFull.ttf: "Droid Sans Fallback" "Regular"
I had to have Emoji One Color before DejaVu since DejaVu provides a number of B&W emoji glyphs. Aha! I am also running MATE. Love that Cinnamon taste. For future adventurers, I went to System Settings -> Fonts -> Default font. Then selected "Ubuntu 10". All looking good, and no need to fiddle with command lines or config files. For people who don't use desktop environments: this means setting your GTK font to your preferred font, not "sans-serif"
rendering errors everywhere: #1, #5, #16, #18, #19. 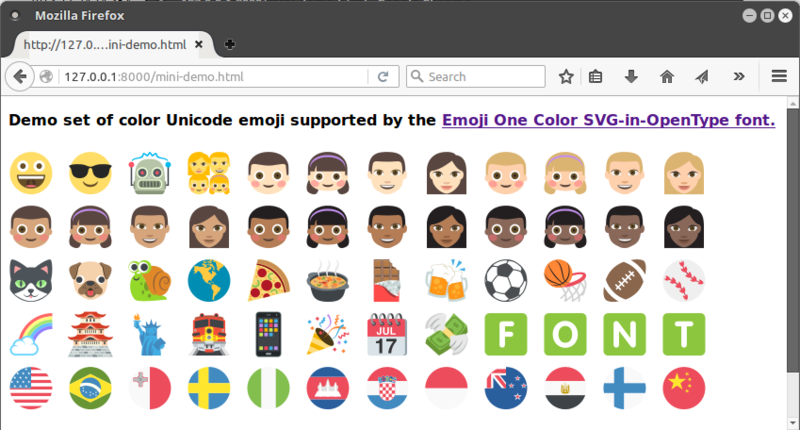 I just noticed Firefox was still using DejaVu Sans as the source for some emoji even though my new fonts.conf has it far down the list. Setting gfx.font_rendering.fontconfig.fontlist.enabled to false and restarting fixed the problem. Setting it back to true kept the new internal font list, sort of a cache clear.